DeepNet Trading Scam Review - Don't Invest into It! DeepNet Trading scam is hailed by its creator, John A Palmer as a sophisticated software that scans the deep web for profitable trades. Don’t be fooled, as DeepNet Trading is a scam. Read our full DeepNet Trading review to find out the truths behind his lies. DeepNet Trading found at deepnettrading.com is an automated binary trading software founded by the alleged owner, John A Palmer. Palmer describes the software as high speed, sophisticated robot that is able to scan the deep web for trade setups that can bring you profits. He claimed that the idea of using deep web first came about when he navigated the blocked sites in China. This is the first loophole of DeepNet Trading scam. Palmer is using the internet jargon to confuse and deceive the general masses who do not have much knowledge about internet censorship and the deep web. Deep web has nothing to do with bypassing censored websites. In China and any other countries, people use virtual private network (VPN) to bypass the censored materials instead of deep web. So does deep web has anything to do with binary options trading? Not at all. You can find out more about deep web if you’re interested. Compare this lady to the one featured within the sales video of DeepNet Trading scam (captured in the first image of this review). In the sales video, she claimed that she made a fortune using the software. However, she was lying to you. Turns out she is actually a paid Fiverr actress who was hired by the scammers behind DeepNet Trading to record the fake testimonial. She was paid to read off the script like a real testimonial, in order to produce a fake illusion that the software works. 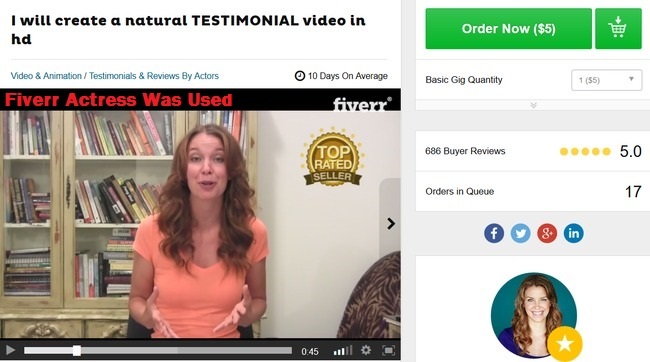 A fake testimonial can generally be bought from Fiverr.com for as low as $5. We do not condone or condemn the act of buying and selling fake testimonials, but we want you to be aware of this – that fake testimonials can be bought online very easily. The next time you come across a dubious internet opportunity that sounds too good to be true, such as DeepNet Trading scam, stay alert and do some research. It is most likely a scam. As much as John A Palmer tries to glorify and make DeepNet Trading scam sounds like a surefire way to profit online, they have to include an earnings disclaimer within their website to make sure they don’t get into legal issues. You won’t find this document anywhere within the sales materials, because it is supposed to be hidden. You can only find it as an extremely small fine print at the bottom of their sales page that reads “earnings disclaimer”. There is no guarantee that you will make money earn any money using the techniques and ideas in these materials. Earning potential is entirely dependent on the person using our product, idea and techniques. We do not purport this as a “get rich scheme”… Nor are we responsible for your actions. Self explanatory – Despite giving you guarantees that you will become rich with the software, DeepNet Trading scam is denying these guarantees in their official disclaimer. Despite ensuring you that no trading experience is required, somehow your earning potential is dependent entirely on your own techniques. Despite promising you an average of $16,576 profits per month (see FAQ below), the scammers do not purport DeepNet Trading as a “get rich scheme”. This is because scams like these are considered illegal in many jurisdictions. Also, if you lose money with the software, they are not responsible for it. This is important – Any profits and earnings reported in the sales material are intended to express the scammers’ opinion of earnings potential. In short, these results are fake! Fact #4 alone should be enough to steer you clear of DeepNet Trading scam. Let’s compare these terms with what the scammers promised you in their FAQ, and you will realize how they try to escape the false promises they’ve given to you. The disclaimer is not there to help you make informed decisions as a user. It’s there to make sure the scammers don’t get into legal problems when you lose all your investments through the scam. 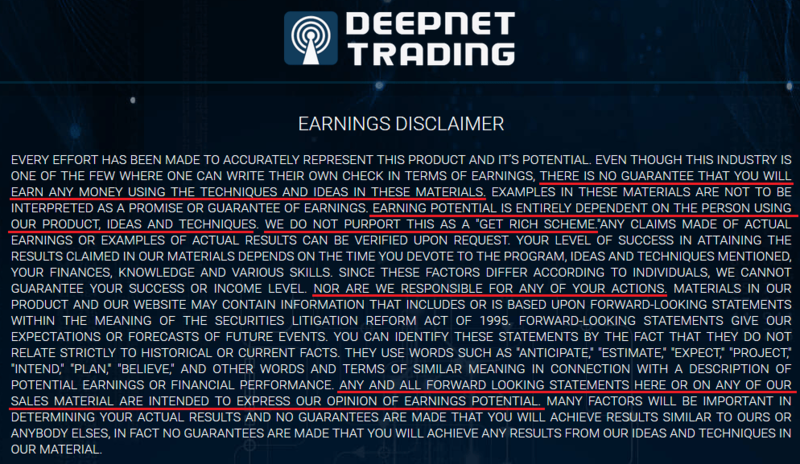 If DeepNet Trading wanted to be honest with you about the risks of using their software, they wouldn’t have used fake member testimonials and deceive you with fake earnings in their sale materials. Why Are People Still Promoting DeepNet Trading? I’m very well aware that there are many reviews out there that claim DeepNet Trading is legitimate and urge you to sign up with them. The fact is, DeepNet Trading scam is paying $250 to affiliates who manage to bring in a victim that makes a FTD (first time deposit) into the broker’s account. 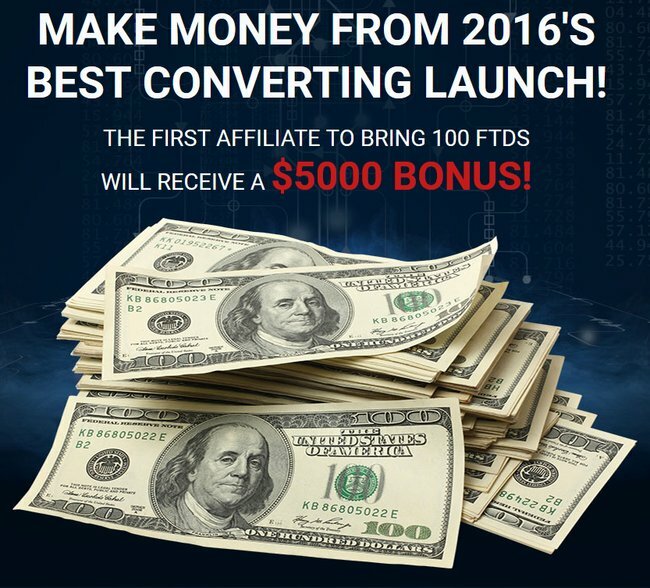 The first affiliate who brings in 100 FTDs is even offered an extra $5,000 bonus! Unfortunately, many reviewers are swayed by the commission and decided to generate a fake review to endorse the scam. As an internet marketer, it’s inevitable that I endorse products too, but I choose to recommend only products that genuinely help people. I could’ve written a raving review for DeepNet Trading scam and encouraged my readers to sign up, and I’ll earn a nice $250 commission once they deposit into their trading accounts. In fact, it’s a lot easier to write than to look for evidences and expose this scam. However, I’ve been a victim of binary software scam before and I don’t want my readers to end up the same. I do realize that I’m revealing the secrets of many affiliates out there, but this is what I’ll do if it means saving a few of my readers from the scam. There’s no click-and-get-rich software, because such thing simply doesn’t exist. You need to put in time and effort to make money online. Is DeepNet Trading a Scam? YES, DEEPNET TRADING IS A SCAM. We strongly advise you to stay away from the scam if you don’t want to lose your hard-earned money. 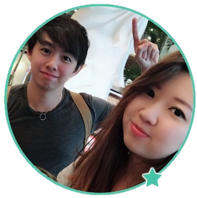 Trade Fusion Scam Review – Don’t Sign Up!